I want to share with you a bit of my creative side. I come from a very artistic family, both of my sisters possess their own special talents, although one seems to possess most. Her ability holds no limits, she paints, sculpts and also creates beautiful jewelry. 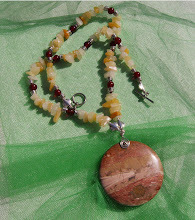 I am inspired by so much around me, I love to make jewelry, and will post some of my original creations on this site. I look forward to hear what others think, I am self taught so many of the things that you see will not always be done the conventional way. I also love to write, I am working on a book that I hope I can finish this year. I have put it to the side for now, I seem to go where the energy pulls me. Sometimes I too get caught up in the day to day responsibility and put my creative side on hold. I hope others will find themselves inspired and share their creative side. Good Luck with your site, looking good! Thanks for pointing out the typo, thats what sister's are for. You could have told me what you thought of the site, I love your fairy it brightens things up. Thank you for your well wishes, hope you come back to check things out and let me know what you think. Sorry, 'bout that, I think the site is terrific! On another note, since you sometimes write about crime, do you have any insight about the Drew/Stacy Peterson case. Love to hear your thoughts. I believe he did it, I would be shocked if he didn't. He is a sick man and I think he knows how to play the game. It would be funny though if his wife is hiding and it's was her way to bring information into light on the first wife, hoping he goes to jail, so she would feel safe. But I really don't think so...it would be a nice twist. I can read it! Does that make me smart??? Or are you trying to humor me? I think he did it as well, but I can't figure how he dispensed with the body... think he has a boat, not sure, have to check that! Nice site, is the jewelry for sale? Thank you. The jewelry will be going on sale, I will publish the information for those of you that have an interest in purchasing some of these pieces. The information will be available within the next week. I love your blog, lulu--not surprised to find you are a writer. So hard to find the time, but at least with this blog you can keep your hand in it a little (that's my rationalization anyway). Good luck! Thanks for stopping by. I really enjoyed your blog and found it very informative, and the layout very nice. I would recommend your site for anyone interested in antiques.